The southern Ionian is ideal for beginners in bareboat sailing holidays and closer to Lefkas one will find the ideal sailing ground for flotillas in Greece. But further south - beyond the island of Zakynthos - there is an off the beaten part of the Ionian that is often overlooked and rarely visited even in the high yacht charter season during the months of July and August. Despite the lack of islands - it is more coasting here than island hopping - this stretch of coast offers an abundance of ancient ports, castles, historic sites and three enormous mountainous promontories each with a distinct character and indeed the south of the Peloponese is a true cruise area in itself. The only problem is who to get there as the main bases for reliable yacht charters are two weeks sailing away - notably Lefkas - Nidri - Preveza in the Ionian and Poros - Lavrion and Athens in the Saronic Gulf. One solution is to try to start your sailing holidays out of ports like Pylos or Kalamata, difficult and often more expensive, but quite worthwhile since these coasts are pristine compared to the aforementioned sailing grounds. Sailing from the Ionian or Italian waters towards the Aegean around the Peloponese (Peloponnese) was in fact in the old days - before the Corinth Canal - the only way to reach Athens, and the rounding of the infamous Cape Malea was inevitable. One-ways like this should preferably be sailed from the west to the east because of the prevailing winds. Rounding problems at Cape Malea can be prevented by a) waiting for more agreeable winds or b) including Kythira into the itinerary. 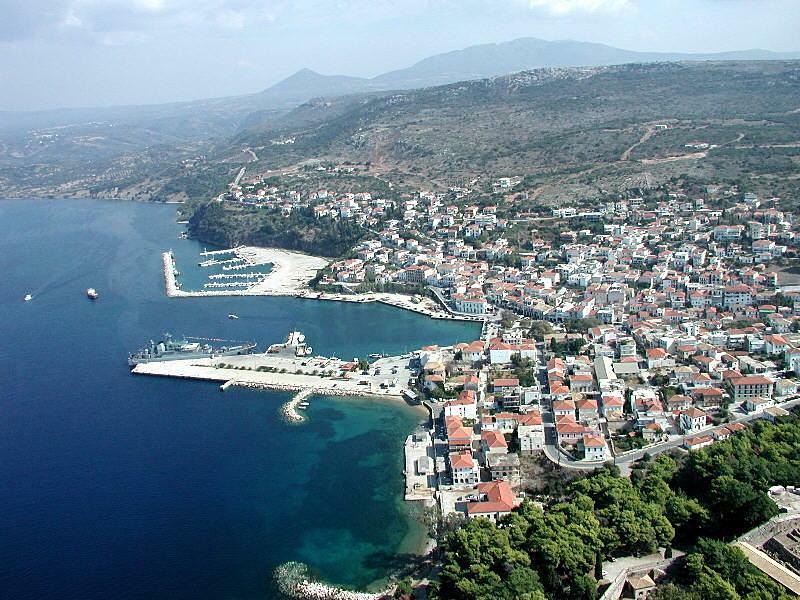 Above an aerial photo of Pylos port in the south Peloponese - Peloponnese. Along these coasts a lot of amenities are available but you will really appreciate to be away from other bareboat yacht charters or gulets and motorsailers that are found in other parts of Greece.